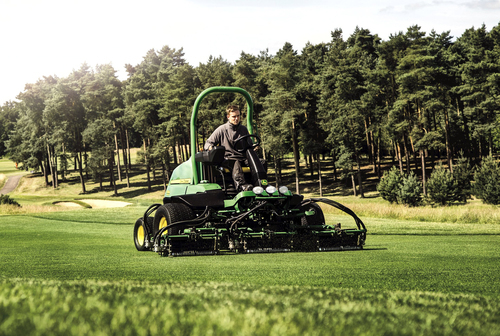 One of John Deere’s new A Model fairway mowers, a 7700A PrecisionCut model, will be shown for the first time at BTME 2015 in Harrogate. The company will be taking a small-scale stand to highlight the range’s advanced technology features, which are designed to produce a higher quality finish on golf courses and other sports and amenity turf areas, as well as provide users with greater control of the machines and easier operator training. Based on extensive feedback from greenkeepers and other golf and turf industry professionals, these features include a simple to use TechControl digital display, LoadMatch as used on the John Deere compact tractor range, and OnCourse Technology for improved overall performance and reliability, better diagnostics and increased operator comfort. The simple to use, password protected TechControl display enables the course manager, head greenkeeper or deputy to quickly set or change mowing, turning and transport speeds, for example, to limit variations in performance by different operators and provide a more consistent, quality finish. On-board visual diagnostics and the ability to set regular service intervals also help to maximise productive time. John Deere will also be joining BIGGA in announcing the regional winners of a special membership promotion at the show. Five lucky members of BIGGA (plus one GCSAI member in Ireland) are being given a once-in-a-lifetime opportunity to travel to the US and work with the greenkeeping team and other volunteers from around the world at the legendary Tournament Players Club at Sawgrass in Ponte Vedra Beach, Florida. The TPC Sawgrass volunteer programme will see the winners travel to the States in May 2015 to work on the course before and during the Players’ Championship, a PGA Tour event. "John Deere is a long-term supporter of both BIGGA and the GCSAI, so we are very pleased to provide this exciting new opportunity for their members,” says John Deere Limited turf division manager Chris Meacock.